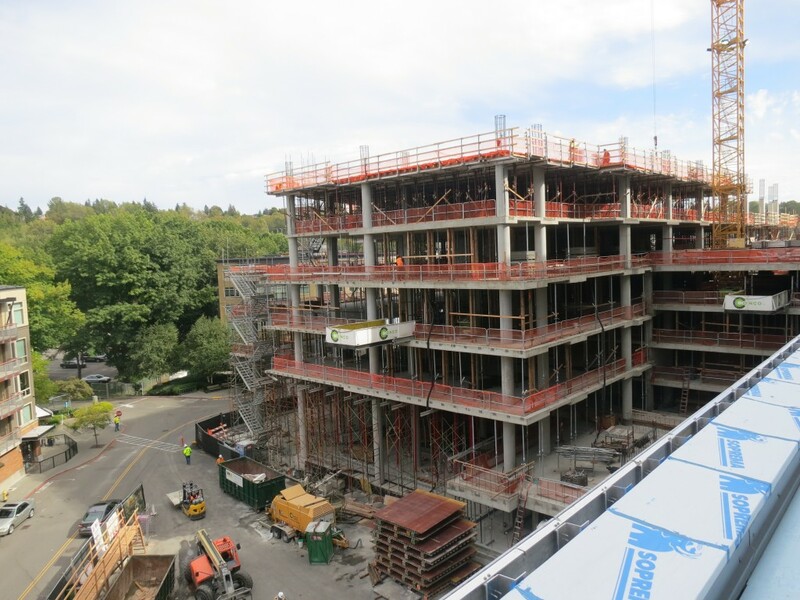 Tower 1 construction progresses this month with the main focus on the lower lobby areas and restrooms going up the tower. 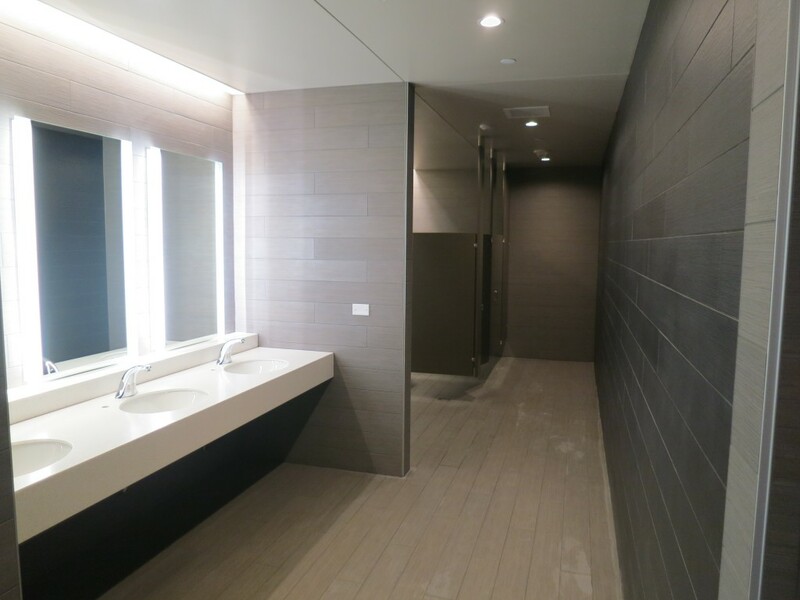 The tower restrooms have tile complete with countertops, fixtures, and partitions to follow. 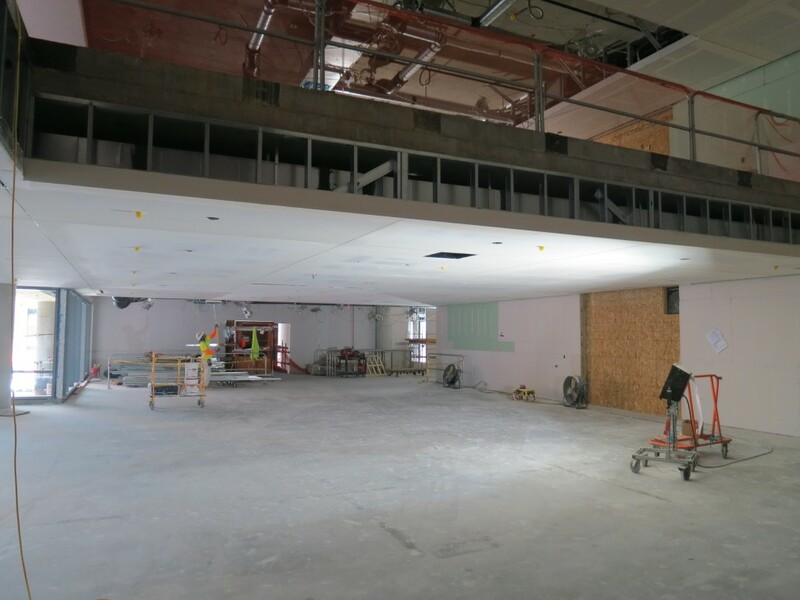 Sheet rock install is ongoing at the common areas along with the beginning of paint. 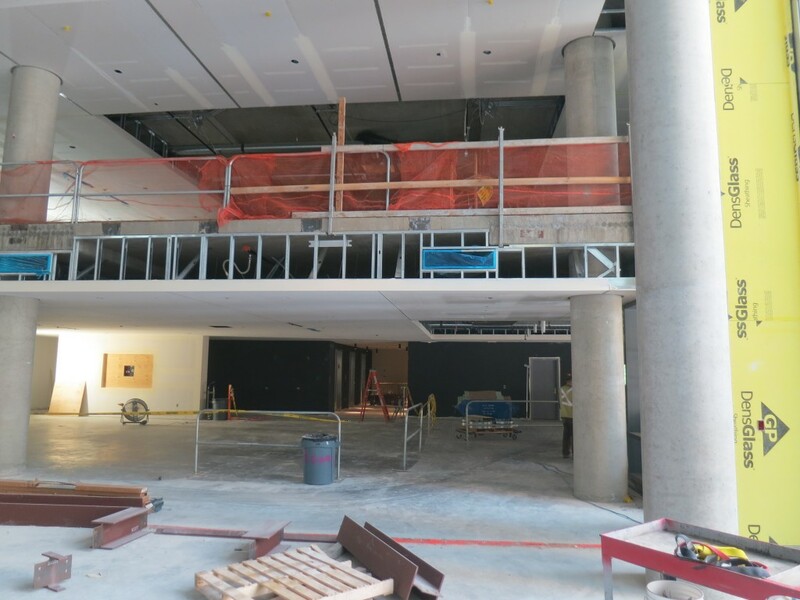 The structure for the slatted wood ceiling is now being installed around the skylight in the main lobby. 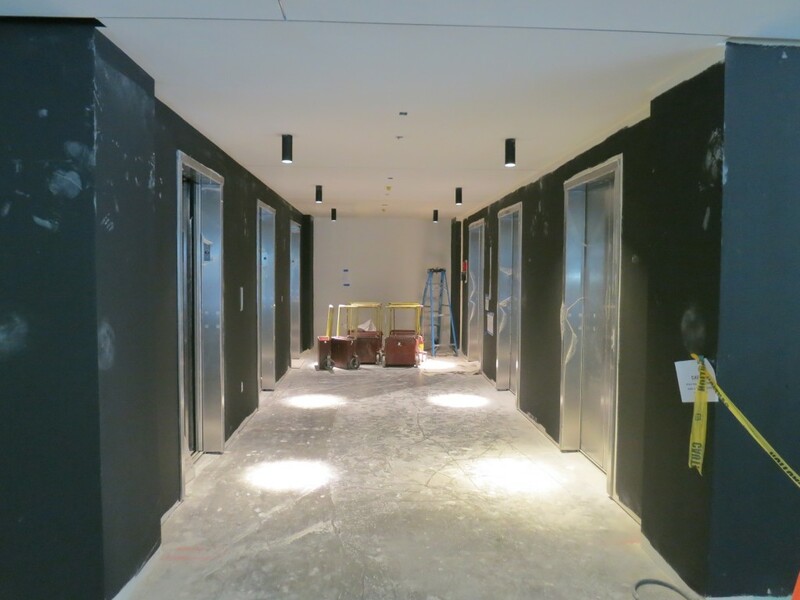 In addition, the metal stair stringers are going in from the ground level vestibule up to the Level 1 main lobby area. 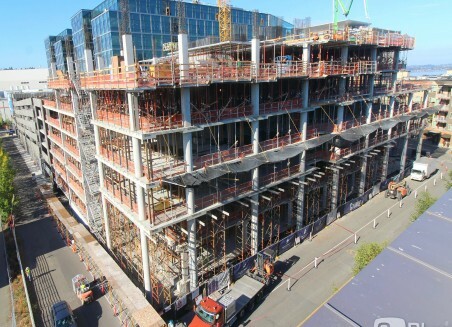 The management offices at the ground floor have also begun MEPF rough-in. Work at the elevator cabs and elevator lobbies continues this month with a single cab now available for construction use. With this use, the temporary man-lift for Tower 1 will be dismantled by the end of month so that these concrete slabs can be filled moving up the tower. Mechanical screen work at the roof is nearly complete. 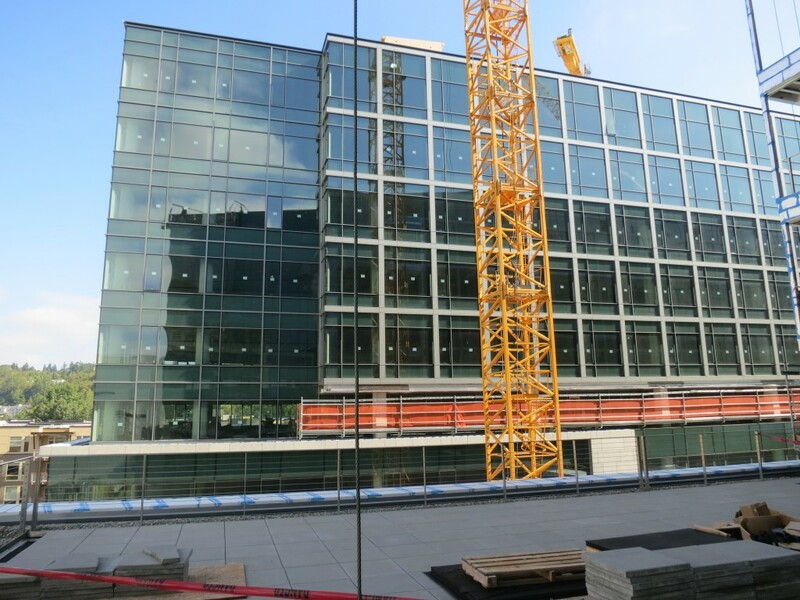 The pavers and finishes at the Level 4 terraces are complete as the level 5 to level 8 exterior balconies continue this month with the install of the stainless handrails and storefront glazing. 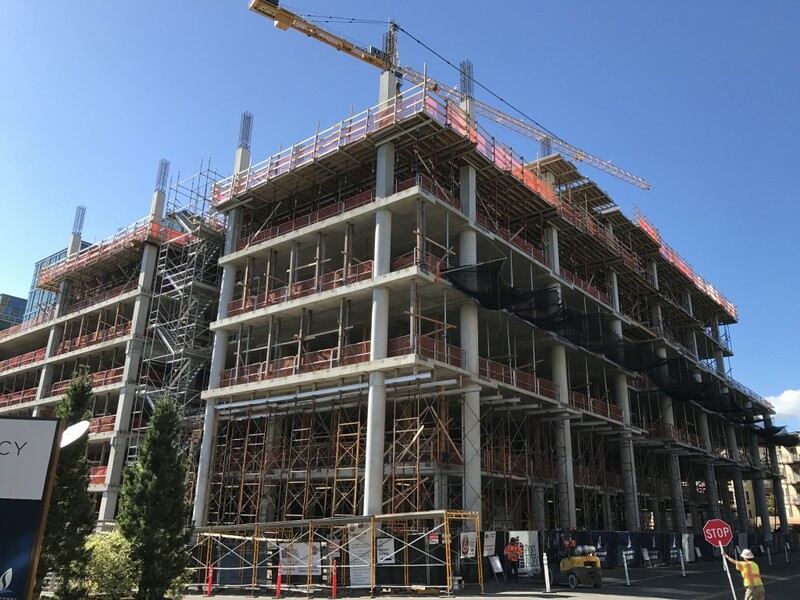 Tower 2 construction continues this month with sheetrock finishing at the lower levels similar to progression on Tower 1 along with the stairs being installed from the ground level. Restroom install is progressing as well with tiling complete in most of the tower with grouting to follow. 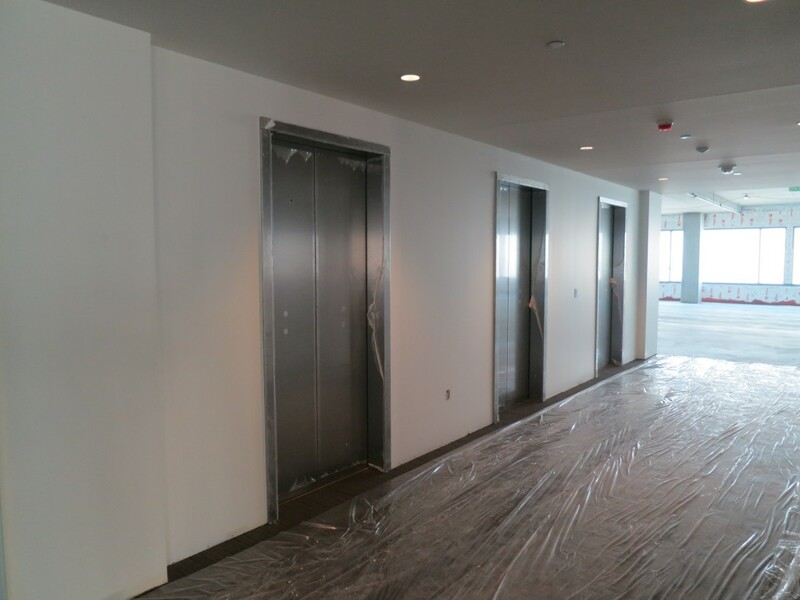 Door fronts and shaft construction is ongoing for the elevators. 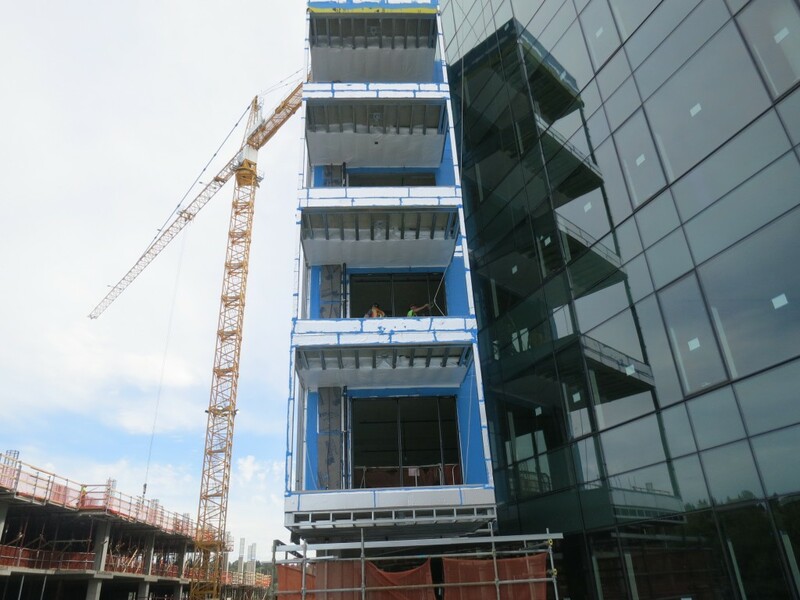 The exterior balconies have waterproofing, flashing, and framing continuing this month. Temporary heat is being supplied for both Tower 1 and 2 to regulate temperature and humidity so that wood paneling can begin in mid-October. 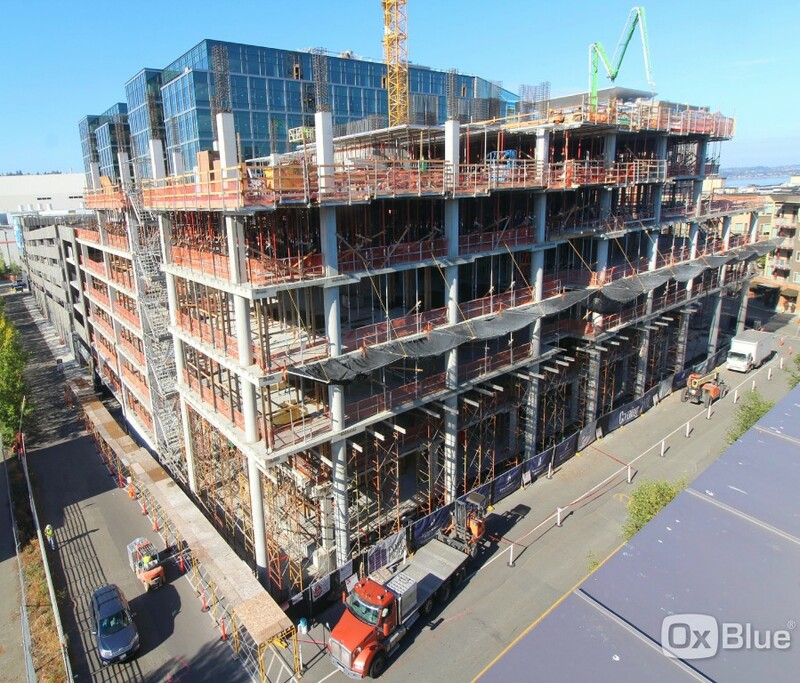 Tower 3 concrete decks are on schedule to be completed by the end of 2018 as they are currently poured up to Office level 6. The parking levels are complete. 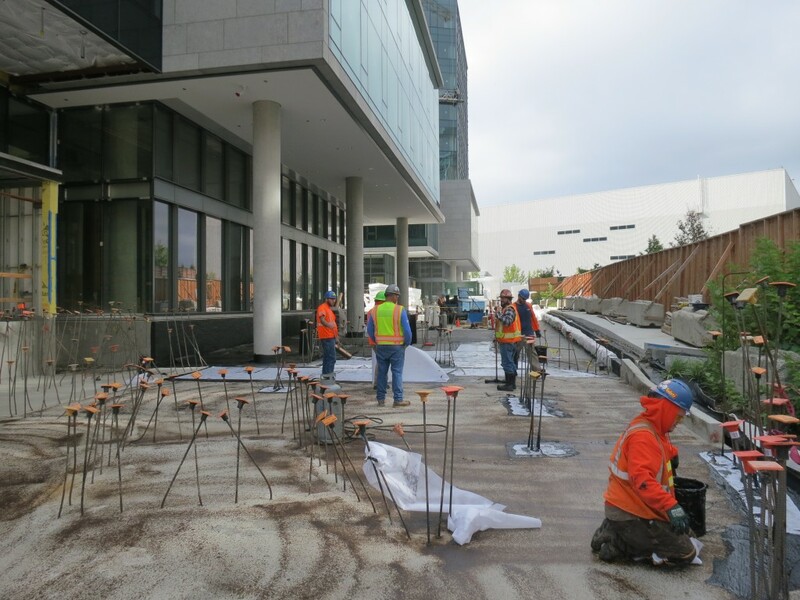 Site preparation has been ongoing for the plaza area between towers 1 and 2 with additional foam and hardscape layout. 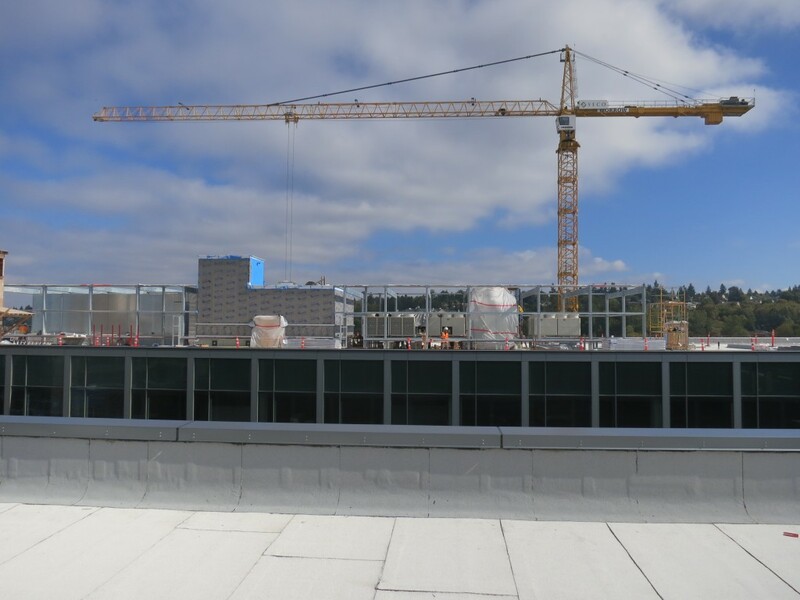 The north tower crane is scheduled to be removed in late October so that the plaza area can be finished. The garage continues to be used for Hyatt guests and retail patrons for self-parking. Signage is nearly complete in the garage. Parking equipment has been installed and is currently being tested for daily use. 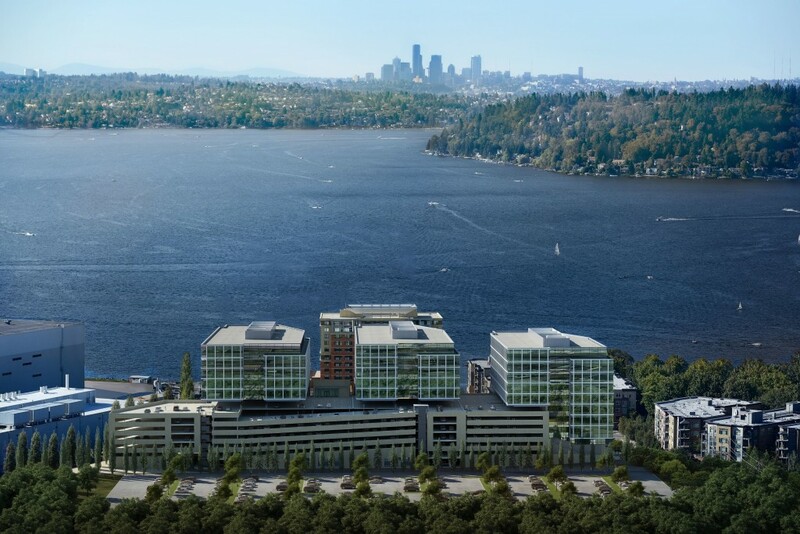 The road improvements for Lake Washington Boulevard started at the end of last month. 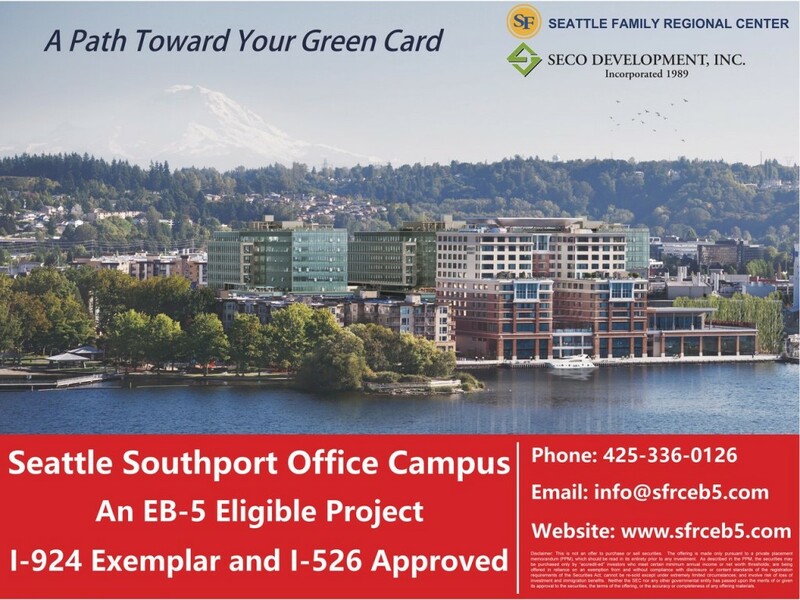 The construction when complete will widen the entry road to the Southport campus to 4 lanes. 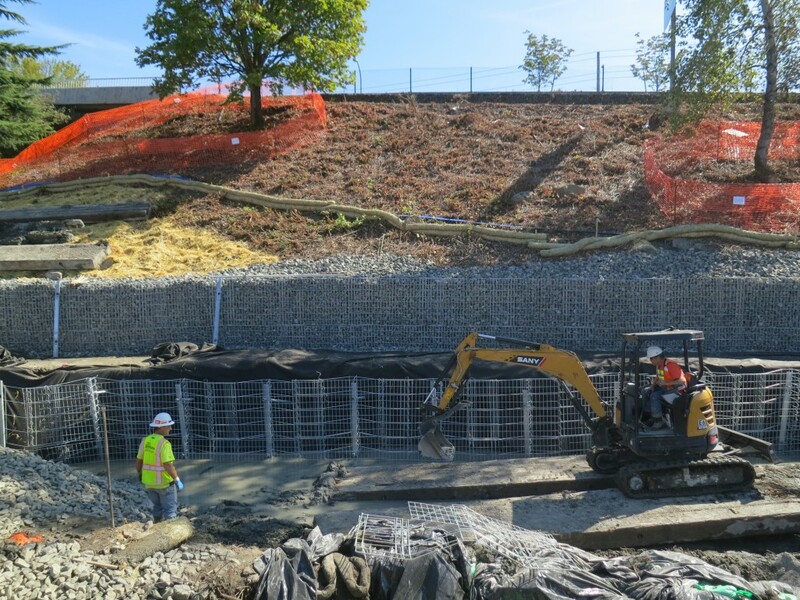 Hillside gabion walls and an enlarged stream bed need to be completed prior to paving. 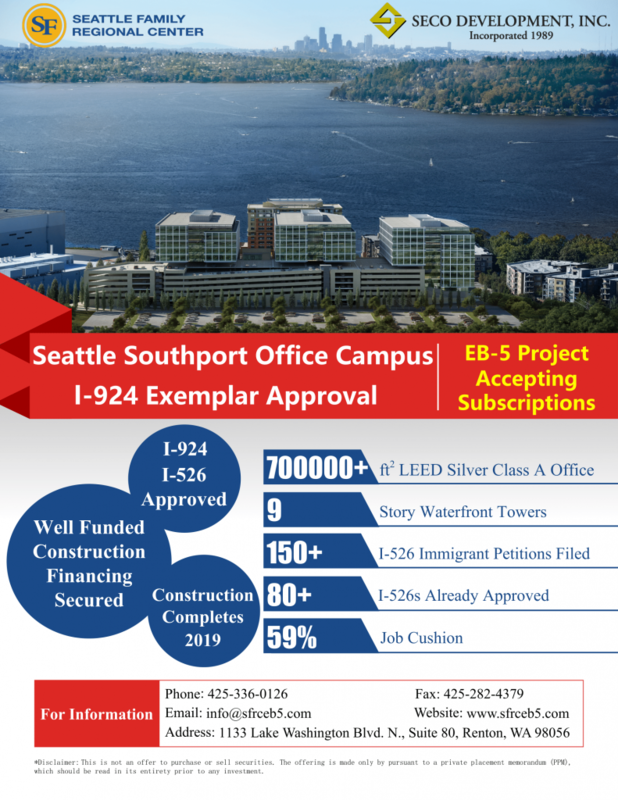 The project is anticipated to be completed by the end of the year.